FREMONT, CA, May 31, 2018 – CORSAIR®, a world leader in PC gaming peripherals and enthusiast components, today announced the latest addition to its growing line of gaming headsets, the CORSAIR HS70 WIRELESS Series. Joining CORSAIR’s award-winning range of HS headsets launched last year with HS50 and HS60, HS70 WIRELESS headsets are available in subtly styled Carbon, White or SE trim and are compatible with both PC and Sony PlayStation 4, for great gaming audio whether you play on a desktop, laptop or a couch. Combining exceptional comfort, premium build quality and precision gaming sound with long battery life, HS70 WIRELESS is the perfect companion for gamers looking to get serious about their setup. When your game time lasts all day, your headset needs to be right there with you. HS70 WIRELESS’ plush memory foam ear pads and adjustable padded headband provide outstanding comfort with the minimum of distractions, letting you focus on what matters most, whether it’s the next round, the next command, or your next target. It’s not just HS70’s comfort that lasts; renowned CORSAIR build quality and metal construction ensure the long-term reliability players expect from their headset, so they can look forward to great gaming audio in their favorite games today, and the DLC and sequels for years to come. Whether it’s the footstep of an enemy, a nearby ricochet or a pounding soundtrack, HS70 WIRELESS features 50mm neodymium speaker drivers that deliver accurate, wide-ranging audio, so you won’t miss a cue or sound when it counts. Immersion gets even better on PC, with virtual 7.1 surrounds multi-channel positional audio powered by COSAIR iCUE software that puts players in the middle of the action. HS70 WIRELESS also delivers when you need to be heard, with a unidirectional Discord certified, detachable microphone that reduces ambient noise. Whether it’s planning your next strategy, or just chatting with friends, they’ll hear you loud and clear. Beneath the subtle styling and immersive audio, HS70 WIRELESS features a built-in battery providing up to 16 hours of constant wireless use, or plug-in via USB to keep playing during charging. Convenient on-ear controls for volume and microphone mute are always within reach, and HS70 WIRELESS’ 2.4GHz low-latency wireless boasts a range of up to 40ft from the included USB adapter, so you don’t need to miss out, even when you go AFK. 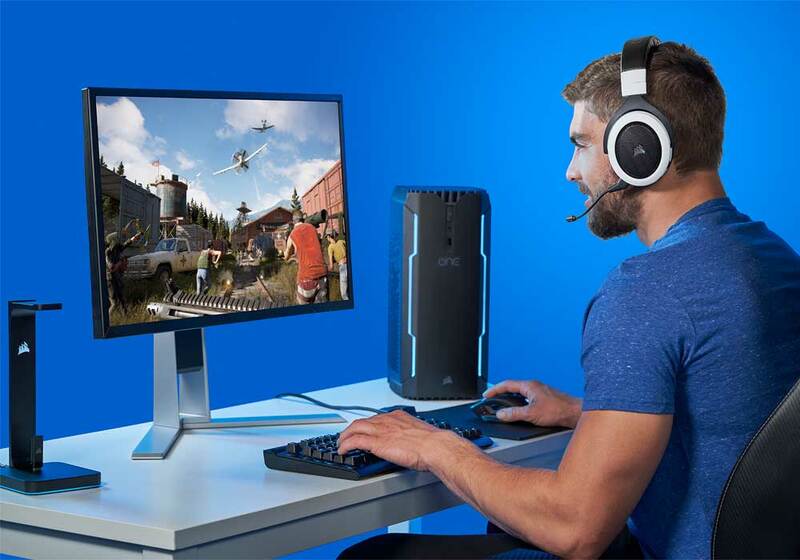 With comfort to play all-day, the durability to last, audio quality that doesn’t miss a beat and long-life wireless, the new HS70 WIRELESS Series of headsets offer the complete package for gamers looking to get serious about their audio. 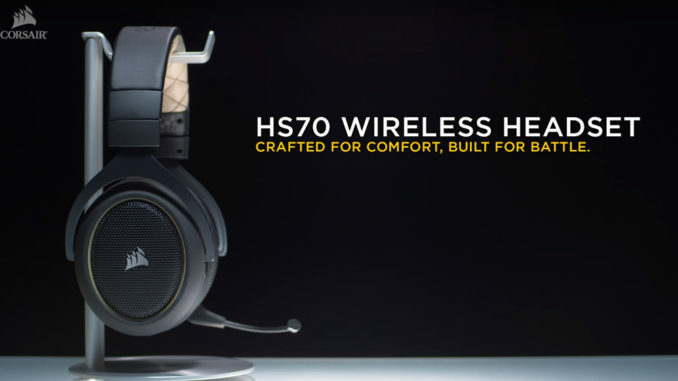 The full line-up of HS70 Wireless Gaming Headsets is available immediately from the CORSAIR worldwide network of authorized retailers and distributors, as well as direct from the www.corsair.com webstore. All HS70 Wireless Gaming Headsets are backed by a two-year warranty and the CORSAIR worldwide customer service and technical support network. For up-to-date pricing of the HS70 Wireless Gaming Headsets, please refer to the CORSAIR website or contact your local CORSAIR sales or PR representative.